Excavations of caves and native american villages and campsites throughout history have put the grouse as being here for over 25,000 years at a minimum. New York’s grouse were first a source of food for Native Americans long before the area was settled. It is rumored that the native americans would set fires to spook out game to harvest, the grouse amongst them. I have never been able to find anything to substantiate this but we do know that they were hunted by the natives for food. To the native americans the grouse was known by many names including bi-ne, carpenter bird, ka-xit’l-se, kwi-ut-pah-uta, pupuskee, puskee, and wen gi-da-bi-ne. Shortly thereafter we find the written account spoken about on the previous page that led to the discovery of iron ore in the Adirondacks. This was the case of an expedition by boat to search for iron ore. The skipper of that is man boat by the name of A.M. Martin. During the trip he took advantage of a calm day nearby to where his boat was moored. ” He crooked his arm around his gun and sallied forth in search of partridges and a change of diet. Following a bird that had flushed, he tried to pull himself over a small ledge by grabbing a small bush. When this pulled loose, it uncovered a dark, interesting looking stone. Sticking it into his pocket he hurried on. He then sent it to Ticonderoga, there to be recognized as high-grade iron-ore. Thus were the penfield iron deposits discovered”. As it were, this took place in the early 1700’s. The first records of grouse being described by science were the result of an expedition by John Bartram. He sent a letter to England in 1750 writing about the bird. His letter was accompanied by a grouse specimen which was included in Linnaeus‘s “Systema Naturae” known to be the basis of wildlife nomenclature. He later wrote in letters to england about how good their meat was. Indeed, many settlers wrote about the grouse as table fare to include Audubon who wrote that the grouse would…. Early english settlers in the east took to calling the bird “birch partridge” and lesser used names Moor-fowl, ruffled heathcock, and mountain pheasant. French settlers called them La Grosee, Gelinote de Canada, and Coq de Bruyere a Fraise. No matter what name they were known by it is spoken of in many historical circles that the grouse was amazingly abundant. Little did the settlers know, their presence and clearing of the land was the reason for the abundance of the birds. Swainson and Richardson wrote that grouse “frequents the horse paths and clearings about the forts.” In turn, as settlements grew and the land was cleared to a greater extent, people started to notice that wherever large settlements popped up, the grouse number went down. Bartram whom I’ve quoted here before wrote about the decline around settlements in Pennsylvania. Thanks to settlers and growth. Grouse hunting saw its early modern beginnings somewhere in the early 1750s in the form of market hunting. In NY in 1763 the price of grouse for market hunters was .24 each. In 1877 they were .40 for a pair and in 1899 they were 2.00 for a pair. You can see the decline in populations by tracking the market prices for the birds. By 1910 the birds were 2.00 each. They were a popular bid for market hunters due to how easy it was for hunters to harvest them. Snares became a popular method for market hunters to get their grouse, practice still used by poachers today. As recently as 1950 there are reports of rangers finding and confiscating large numbers of grouse snares. People who were snaring grouse had to be good trappers. The preferred method of the day was to shoot them. Most of the birds sent to market were shot on the ground. It is said that the average take for these hunters groundswatting birds would take in excess of 15 birds a day. This ultimately led to the distaste by sporting hunters to think poorly of anyone who would shoot them on the ground. Market hunting for grouse was so popular that Hotels and restaurants would hire and empty their own hunters. One trapper in Chenango county reported selling 3500 grouse to a NY hotel. In 1875 some 2500 birds were shipped to Ny markets from the Poughkeepsie railroad station alone. Market hunting wasn’t frowned upon during the eighteenth century not one bit. It wasn’t until the early 1900’s that people noticed the decline in numbers and started to complain. It wasn’t the first time people noticed however. This led to the banning of market hunting for grouse in 1903. It wasn’t the first time people noticed however. In 1708 there was a closed season on grouse in the province of NY. In 1791 three counties in NY now a part of NYC had imposed up on them a seasonal restriction where they could not be hunted from April 1 through October 5th. Poaching became widespread and the prohibition of their sale was enacted in 1837 in four counties. In 1839 the whole state adopted the closed season. A market hunter by the name of W.E. Hookway referenced in Forest and Stream Magazine wrote that a friend of his fathers employed by the old Saratoga hotel killed only one bird in 1867. Another famous example comes from a famous grouse hunter of the time Judge John W Spoare. He is reputed to have sold his hunting dog because “the partridge are all gone.” Finally in 1903 spring shooting was eliminated and market hunting was banned. That all sounds like great news but it wasn’t the end of bad news for grouse. In the middle of the nineteenth century apple orchards were booming in New England. Being what they are, grouse flocked to apple orchards and the farmers took notice. Farmers started claiming damages to their crops due to grouse and damages were being paid out. In one instance the state of New Hampshire paid out 26,800.72 in damages to the orchards. Grouse bounties were placed and as much as .25 a bird was being dished out. Fortunately it was around this time that sport hunting for grouse was becoming more prominent. That, coupled with the decline of apple orchards led to the bounties being brought to an end. It was around this time that people began to realize on a major scale what damage had been done. People were becoming so alarmed that in 1906 the NY Forest, Fish and Game Commission conducted an extensive questionnaire about the situation. This questionnaire along with another published by the New York times led to the commonly accepted understanding of “the cycle” as it is known today. The questionnaire revealed nine possible cause for the decline. E.Seymour Woodruff, employed by the NY Forest, Fish and Game commission to conduct the survey concluded that the most probable cause was a combination of the cold wet spring, abundance of predators and an epidemic of disease. By this point, outdoor magazines were picking up on the interest. George Bird Grinell, the publisher of Forest and Stream Magazine listed six of Woddruffs suggestions but put his weight behind the theory that the cutting of the forests and overshooting were the main causes. He was the first to publicize the scarcity of birds as related to the cycle. It was around this time that that major thought was being given to propagation as a means to supplement the declining populations. Included below is a table of recorded releases. It wasn’t a new practice. There are documented efforts that failed as early as 1750. In that case the propagators were trying to tame the birds. The following tables are known attempts at raising them. What followed is a long history of people attempting to propagate grouse in captivity with varied success. Most notably M.W Clark, Dr. Clifton F. Hodge and Arthur Merrill, Harry A. Torrey, and Dr. A.A. Allen. All of these men managed to raise them successfully. The work of these men was pioneering. They successfully raised a great number of grouse. The state of NY itself was at the heart of this effort with a major facility popping up in the catskills. However, ultimately without droning on for many paragraphs, It has since been concluded that they could not be raised in great numbers. The hens are generally incapable of producing large numbers of eggs. Propagation relies heavily on wild eggs and the cost of raising the birds is quite high. 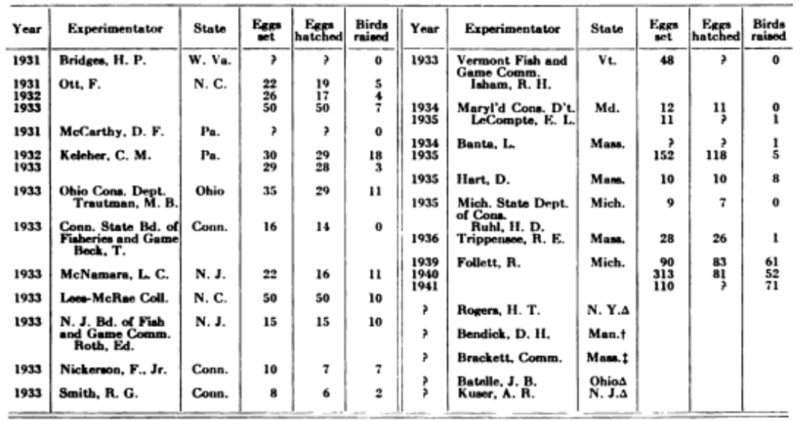 In 1947 is was taking around $15 per bird to raise them to maturity. Ultimately the birds when released would do quite well, but they always lose their fear of man. In the end propagating grouse as means to avoid complete extinction is a possibility, but it’s not feasible as a supplementation. It’s about this point in the history of grouse in NY that such major scale efforts to recover the bird artificially came to an end. Scientists realized that we had done too much damage to their natural habitat and that we need to change our usage habits if they were to stand a chance. I could go on, writing for many more paragraphs on what I have researched but let’s leave off here. Currently the state of NY is a pioneer in the research and conservation efforts of this noble bird. Logging practices are refined and regulated. Habit improvement projects abound in the state and scientists are constantly monitoring the populations. Thanks to the painstaking work that these scientists undertook, we understand the bird so much more than we once did and the future is so much brighter than it was 100 years ago. Although I will never get to see the booming numbers that the early settlers of the Adirondacks were able to experience, I’m grateful that they laid the groundwork for what would become one of the more thriving populations in the country today. All of this information I have given you was garnered from reports conducted by the state of NY and its stewards and they continue to do this great work today. Visit NY to hunt this great game bird for yourself and bear witness to the fruits of their labor. The Adirondacks are one of the last truly magnificent strongholds for the amazing bird and I hope you get a chance to see it for yourself.